I came across this photo recently though it was actually taken over a year ago. 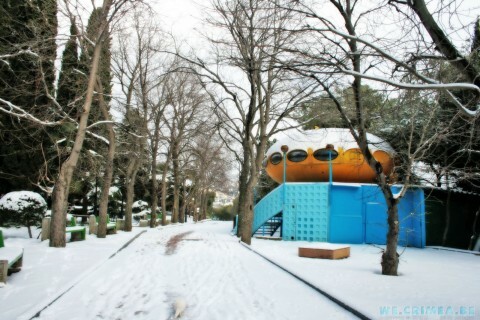 It is not only one of the nicest I have seen of this Futuro but it is also the most recent. The photo was taken by Khuroshvili Ilya 010318. 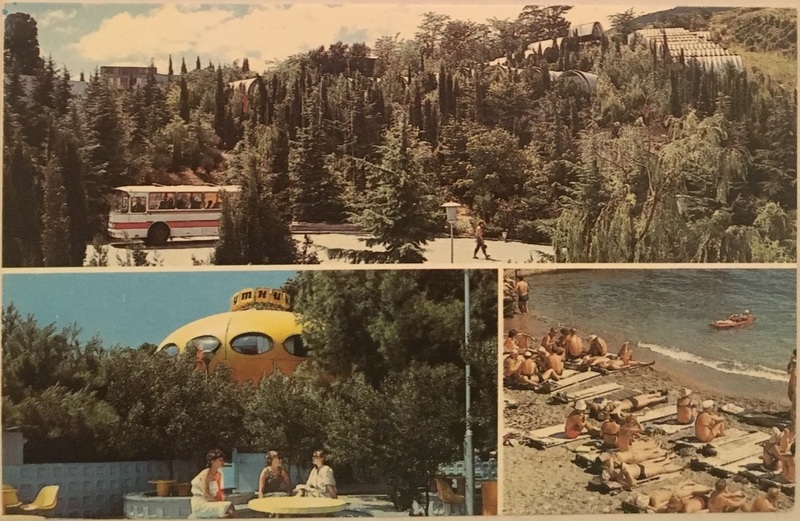 I added this undated multi-view postcard to my collection of "Things Futuro" recently. 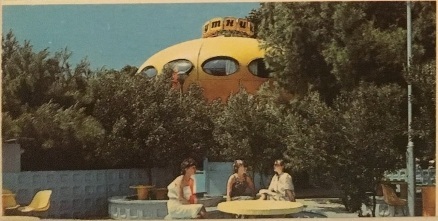 It features this Futuro in one of the photos. 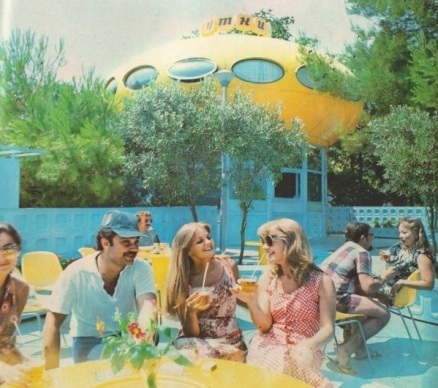 Though undated based on other photos of the Futuro [and the other photos on the postcard - for example note the bus] it is clearly from the early days, likely late 70's or sometime in the 80's. 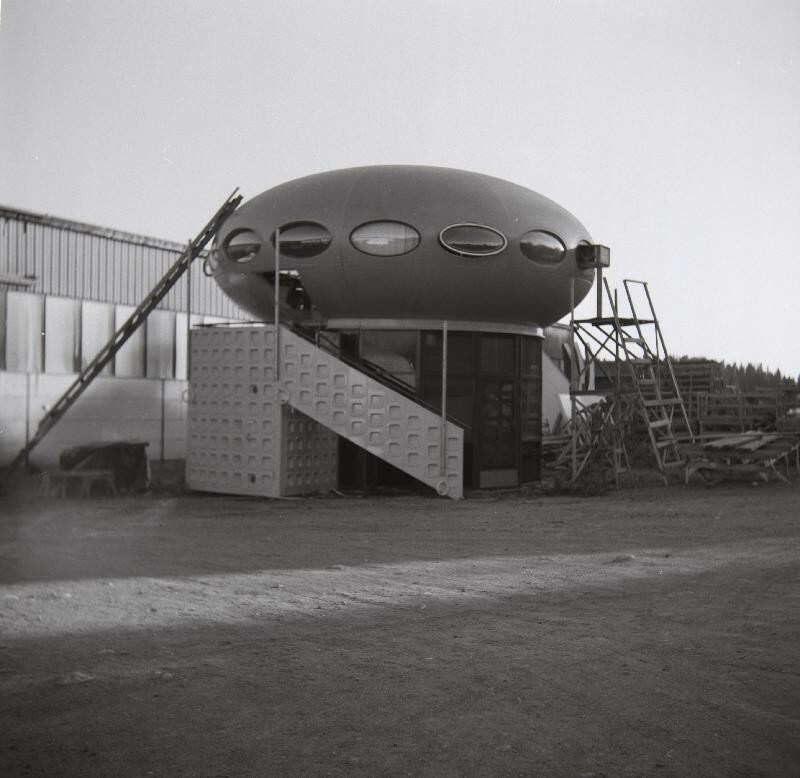 The Espoo City Museum organization includes several other museums along with the WeeGee Exhibition Center [and Futuro #001] and it also includes among its collections a large photographic archive. These photographs are available for use under CC BY-ND 4.0 license and this series of photos, by an unknown photographer, are included here under that license. The copyright on the photographs remains with the Espoo City Museum. The full Espoo City Museum archive can be found here. 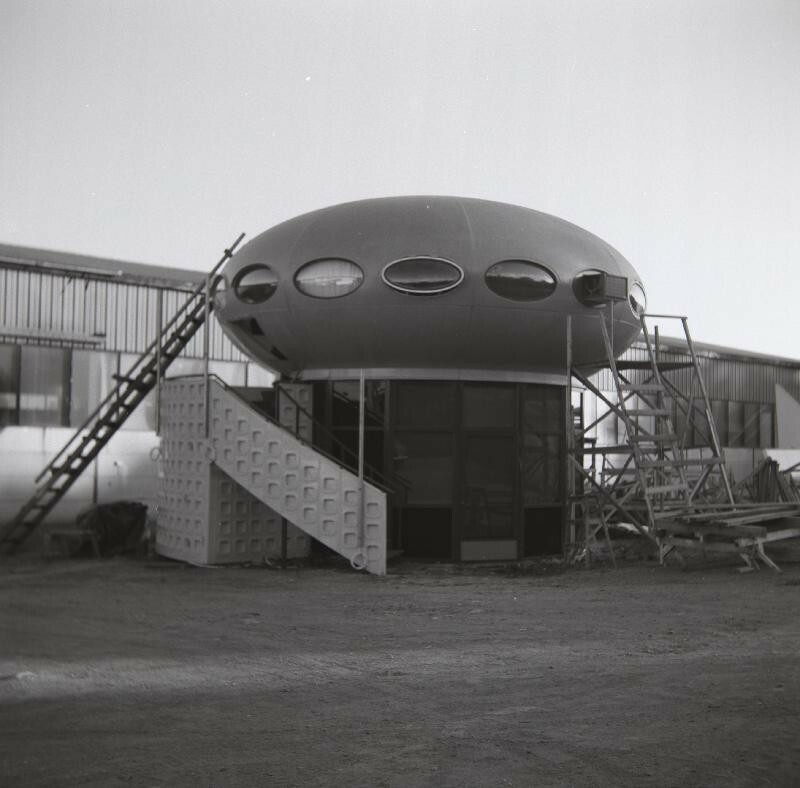 This series of photographs [and the single drawing] all relate to the "two story" variant of the Futuro and specifically to this Futuro. None of the photos are attributed to a photographer. 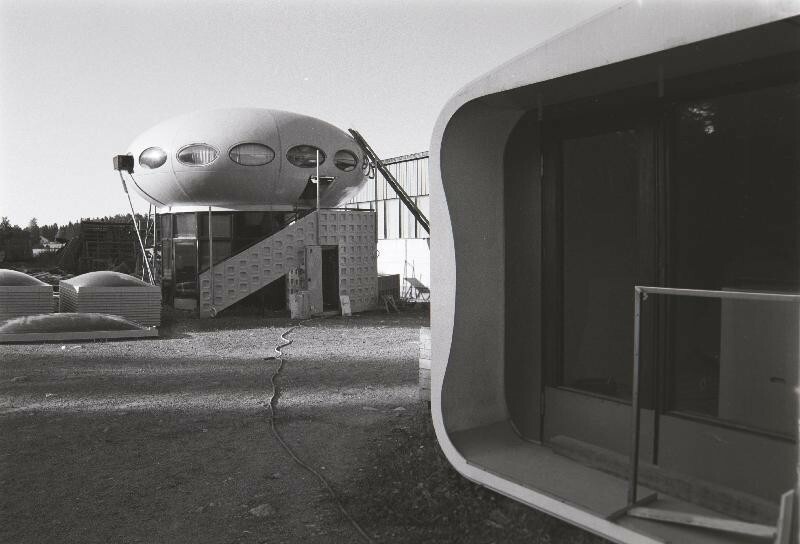 The first four photographs show the Futuro in the yard of the Polykem plant in Ruotsinpyhtää and are dated 1977; this date accords with known information regarding the date of manufacture of the two story variant Futuro for delivery to The Crimea [see "The Finnish 20"]. The last photograph shows the Futuro as installed in Hurzuf. It is dated 1970-1975 which is certainly incorrect as the unit was not manufactured until 1977 so most likely it dates from 1977 or thereabouts. The interior drawing is not specifically noted as relating to the two story variant or the Hurzuf Futuro in particular but given the date on the drawing, the notations "Sputnik" and "Krim" [Crimea] on the drawing along with the pattern of squares seen in the interior decor which exactly matches the pattern of squares seen on peripheral objects [stairway cladding, circular seats, walls] in the photographs it seems to me almost certain the drawing does relate to the two story variant and specifically to the this Futuro. "One version assembled on the yard of the manufacturing plant." 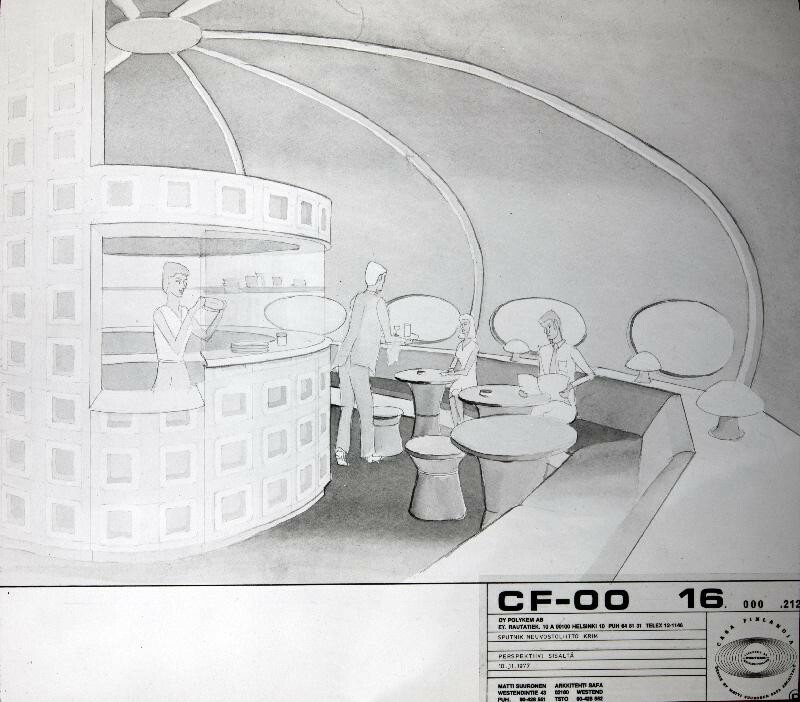 In the 082314 update on this page I concluded that, based on available evidence, this Futuro had likely been located in Hurzuf since its manufacture and purchase in 1977. 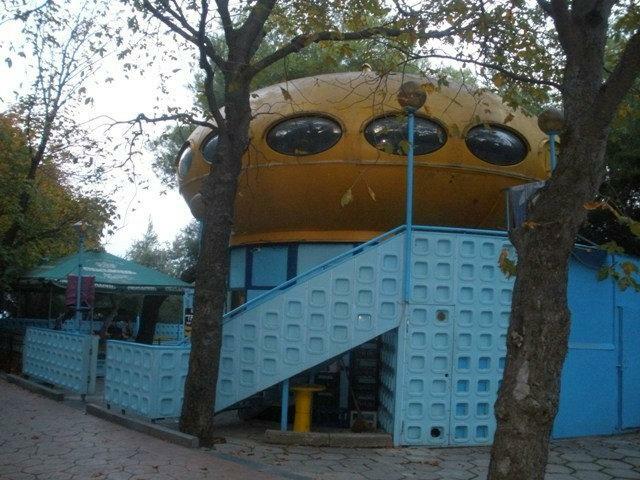 This is the only example of the two-story variant of Futuro that I am aware of. It seems likely therefore that this photo is of the same unit. In addition when comparing this photo to photos of Hurzuf it is apparent the structure is very similar even down to the shape and size of the windows in the lower supporting structure. Based on that it seems to me that this photo, though undated, most likely dates from 1977. 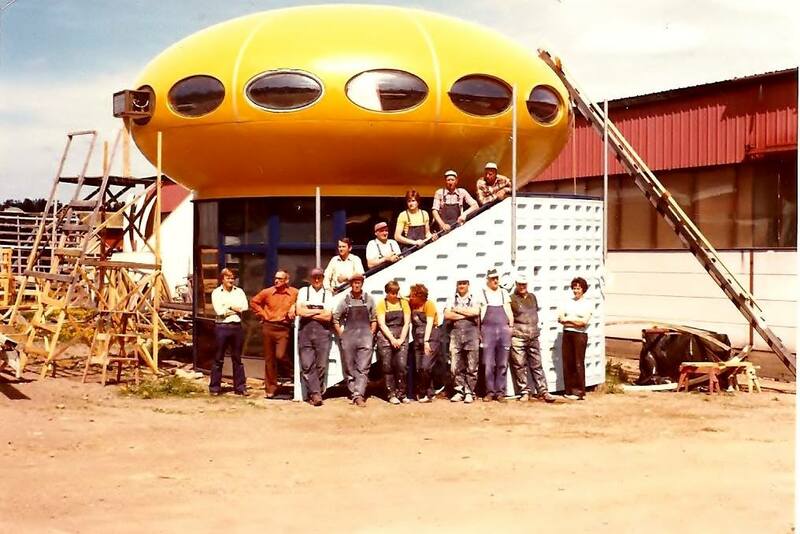 Yves Buysse, who has made many contributions to these pages over the years, sent me this photo recently; nice to see a photo of the Futuro and the bar in "livelier" times. The url for the last photograph appears to be dead and the page is not archived on the Internet Archive Wayback Machine but interestingly it still appears in Google image searches. The Futuro can be seen at some point in each of the following three videos. These videos can be found on Youtube here, here and here. Following the addition of Hurzuf a week or so ago I received several emails with additional information, thoughts and links. As a result of that I am now convinced that the correct location for this unit is 44°32'0.24"N 34°16'23.88"E and that it has been at this location since first being imported from Finland. My thanks to everyone who contributed and in particular to Marko Home and Achim Breiling. So, first, is this indeed the correct location? There are certainly several websites with posts/articles that place the Futuro at this location; among them kimeria.ru, wikimapia.org and esosedi.ru. In addition there is a Panoramio photo by pachu [uploaded 101109] placed at this location which shows a view very similar to that seen in the second of the two videos at left. 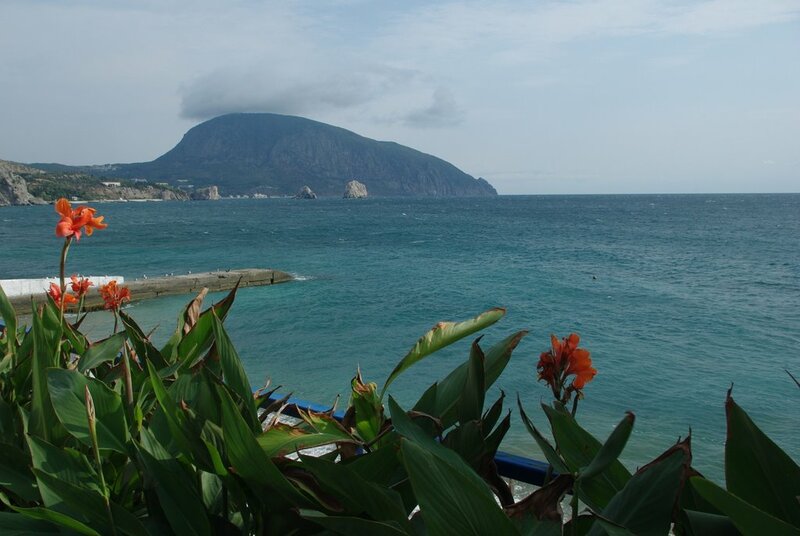 Compare the Panoramio photo with the screenshot from the video; note the mountains in the background and the same quay on the waterfront. Given the various websites placing the Futuro at 44°32'0.24"N 34°16'23.88"E along with photographic evidence and the fact that the object visible at the alternate location [44°32'16.67"N 34°16'28.66"E] is too big to be a Futuro I am forced to conclude that this is indeed the correct and exact location for the Hurzuf Futuro. 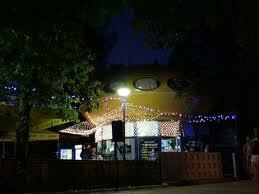 That said are we able to establish whether the Futuro has ever been moved or if it is in its original location? From Matti Suuronen's CV we learn that the two story variant Futuro was manufactured and then purchased by the Soviet youth travel agency Sputnik in 1977. 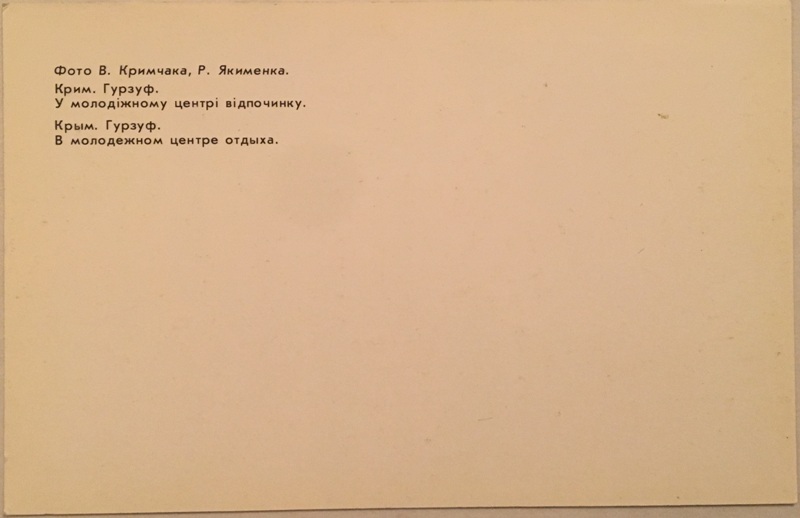 The listing indicates the destination of the unit as Krim which is somewhat non-specific [Wikipedia defines it as "the peninsula Crimea on the northern coast of the Black Sea"] but does include Hurzuf. 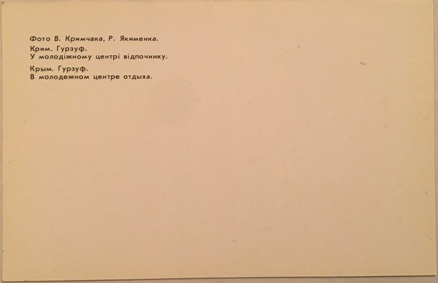 However, as noted below in the original information on 081714, the story of the Plate bar from the website a-a-ah.ru starts by indicating the Futuro has been on site for "more than 30 years". The copyright notice on the webpage indicates "2011-2014" so the Plate story could date from anywhere in that window putting the Futuro, assuming it has always been at its current location, on site for 34-37 years which matches the statement "more than 30 years". 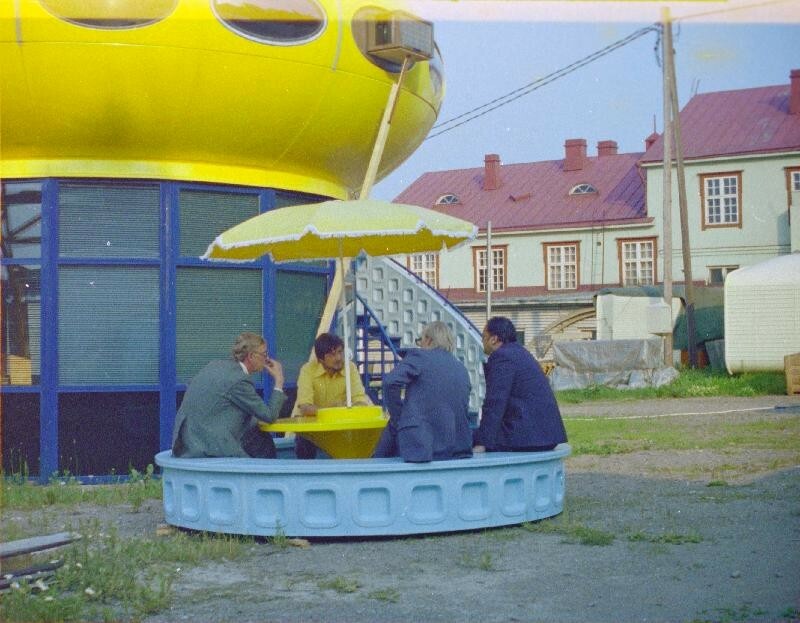 Perhaps the most compelling evidence to suggest that this Futuro has been moved at some point and was originally located in Yalta is the presence of the static "umbrella" installations in the vicinity of the Futuro in some photos and videos; examples can be seen in this photo and in the still below from the Mika Taanila directed film "Futuro: A New Stance for Tomorrow." 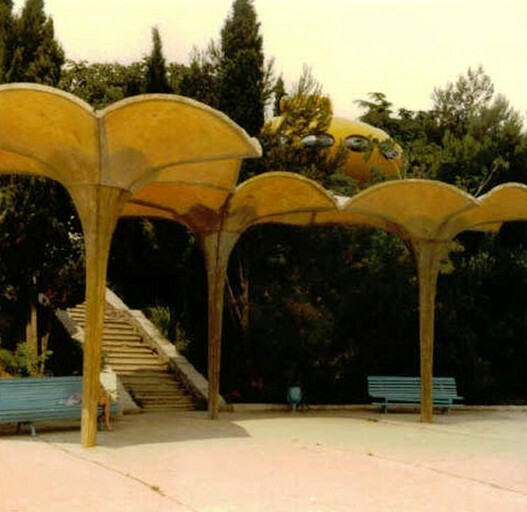 Installations of these "umbrellas" are well documented in Yalta and it was this very fact that caused me to add this Futuro to the "Lost Souls" page as being located in Yalta. 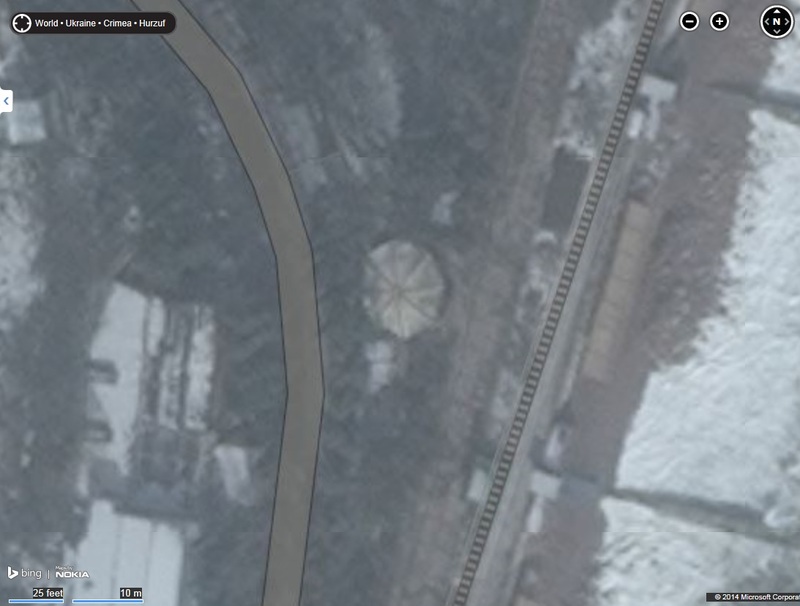 These installations are actually still present in Yalta [see 44°29'25.5"N 34°09'48.7"E and 44°29'23.5"N 34°09'47.7"E] but in each case there are five of the "umbrellas" and in the shots showing the Futuro and the "umbrellas" there are only three. 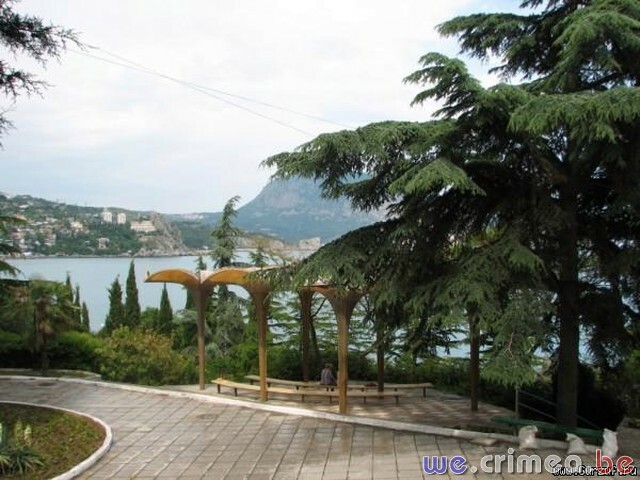 There is however also documentation of there being three of these umbrellas installed in Hurzuf; the photo below is from the website kajuta.net [though based on the watermark it appears it should be credited to we.crimea.be] and this photo clearly depicts an installation of three "umbrellas" in Gurzuf [Hurzuf and Gurzuf appear to be interchangeable names - I use Hurzuf because that is what I see in Google Maps]. "86-year-old Gregory Zaitsev, in 1960, the first secretary of the Komsomol, who oversaw the improvement of the international youth camp "Sputnik" in Gurzuf, says: "There and brought from Moscow, these umbrellas. Their plan to establish the camp. Gift does not fit into the concept of the camp - after staying in Gurzufe had to convince foreign visitors the advantages of the socialist system and the Soviet way of life. 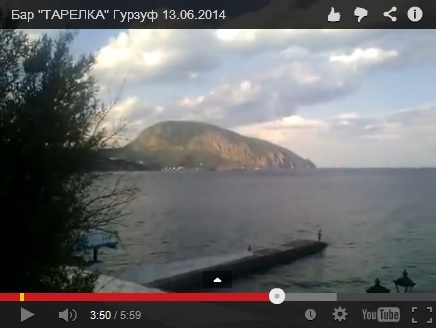 's Guide "companion" gave awnings Yalta." 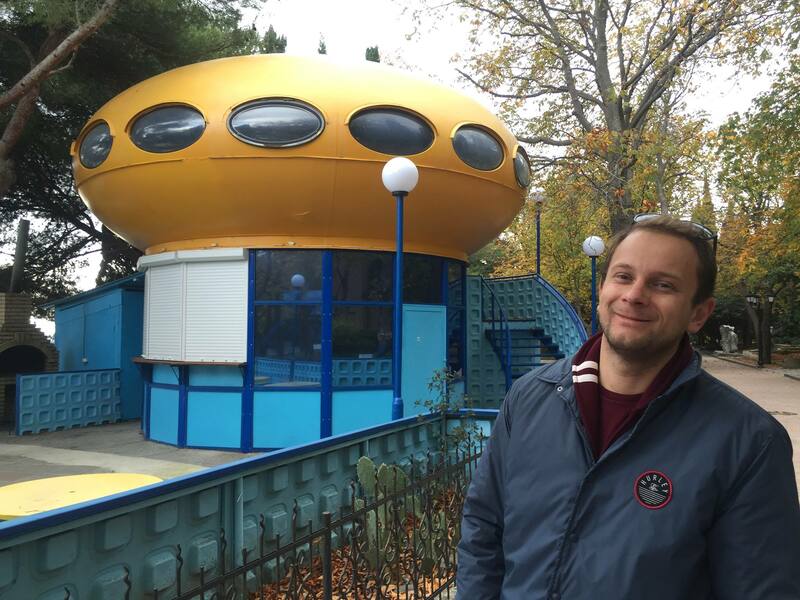 This text not only confirms the presence on an "umbrella" installation in Hurzuf but more importantly it confirms the presence there of the Sputnik youth camp and we know from Matti Suuronen's CV that this Futuro was purchased for installation at such a camp. 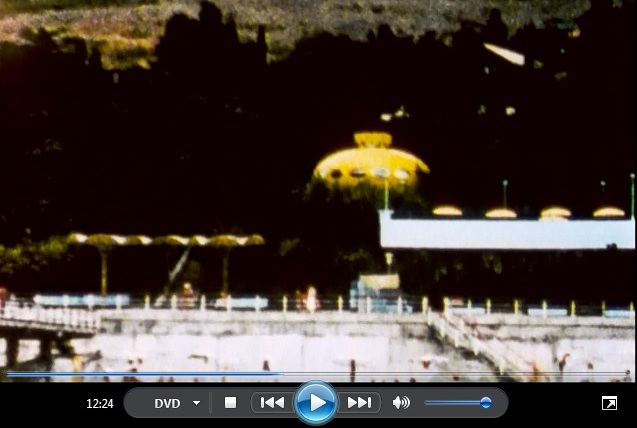 So, based on the evidence above and all of the photographic and other evidence available, I now believe that this Futuro's current location is indeed 44°32'0.24"N 34°16'23.88"E and that this is the location at which the unit was originally installed in 1977. Once again I would like to thank Marko, Achim and others for their contributions and as always if you have anything to add please contact me by email me or by using my Contact Form. And one final observation which should have occurred to me when I watched the second of the two videos at left but did not [it was in fact Marko who pointed it out to me]. 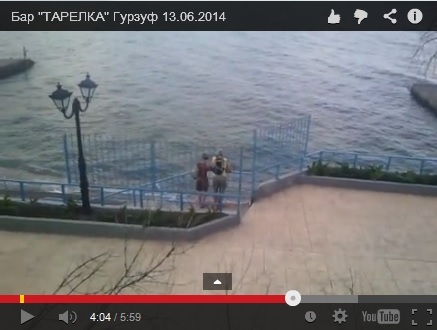 The video is dated 061314 which is the height of the summer tourist season and, if we assume that is the date the footage was shot, we would expect a bar business to be open and likely busy. In fact what we see is the opposite; the business does not appear to be operating and there are no patrons. In addition we see sand, leaves and other debris on tables and seats; also not a sign of a well maintained and busy business. 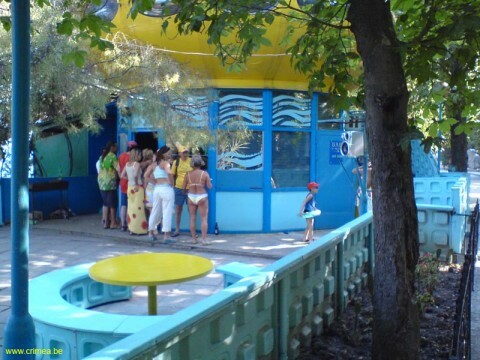 Perhaps the recent Russia/Ukraine tensions have caused tourists to avoid the area and caused the business to close either temporarily or permanently? Pure speculation of course but hopefully we are not seeing the beginning of the end for a Futuro that has stood in the same location for almost 40 years. Time will tell! 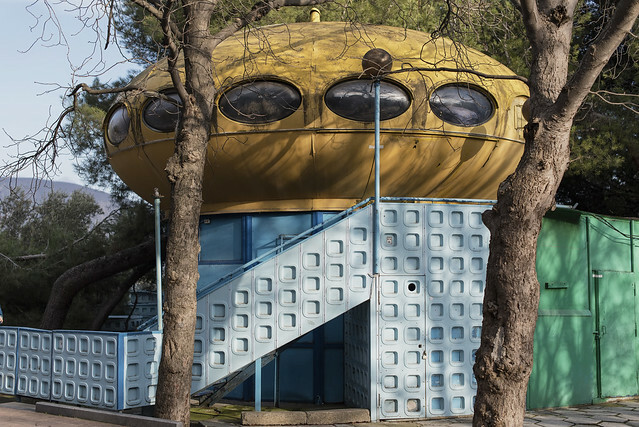 My "Lost Souls" page includes a section on a "lost" two-story variant Futuro that was located in Yalta, Ukraine. 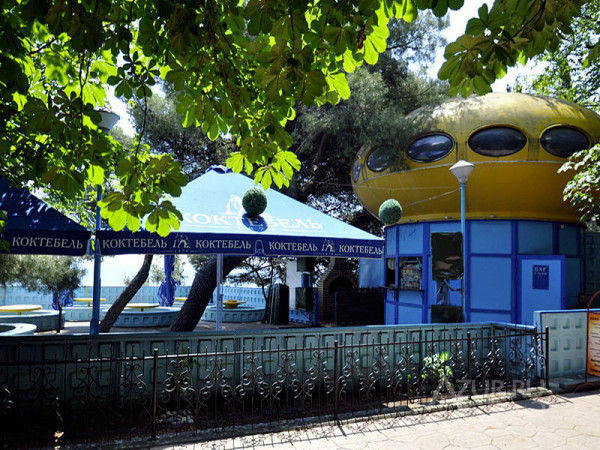 It seems that this Futuro is in fact alive and well and functioning as a bar in Hurzof, a town some 15 or so kilometers up the coast from Yalta. 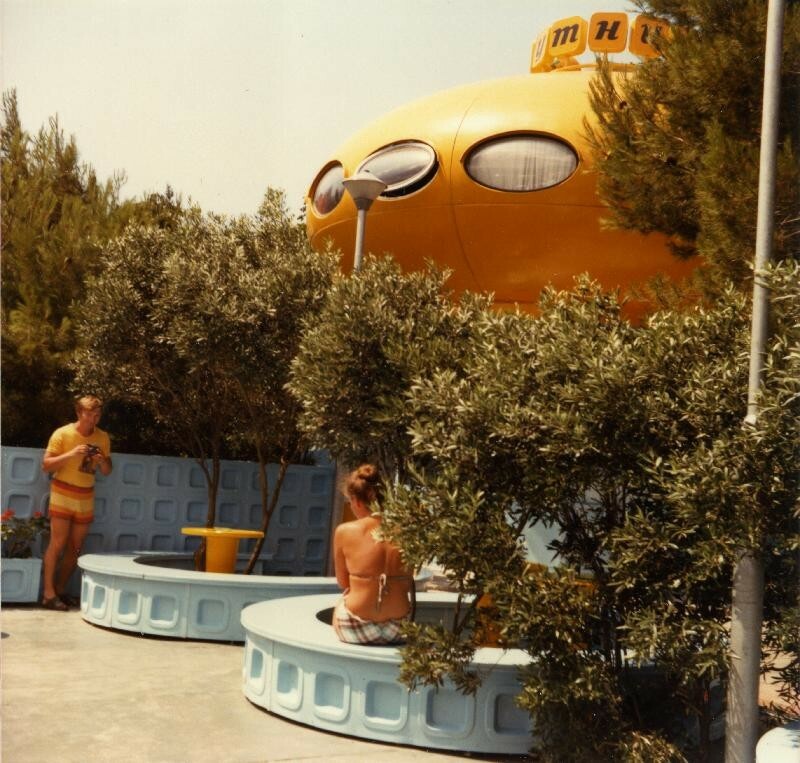 My thanks to Yves Buysse who sent me an email regarding the "rediscovery" of this Futuro. "Plate is proud that his story began more than 30 years ago. Since then many things have changed, but remained unchanged main components: a personalized service and electronic dance music. Disco bar located on the central promenade of the resort, on the territory of the youth center Sputnik. Club complex is surrounded by green palm trees, cypresses and olive trees and is just a short walk from the Black Sea coast. Disco bar includes an indoor hall with a restaurant and a dance floor. In the menu, visitors will find excellent European cuisine made exclusively from natural and fresh ingredients. In addition there is a large summer terrace with a view of the sea. There is also a bar where you will find a wide variety of alcoholic and soft drinks for every taste. There is a large cocktail menu. The club regularly organizes original parties, shows and discos. To order for special events." 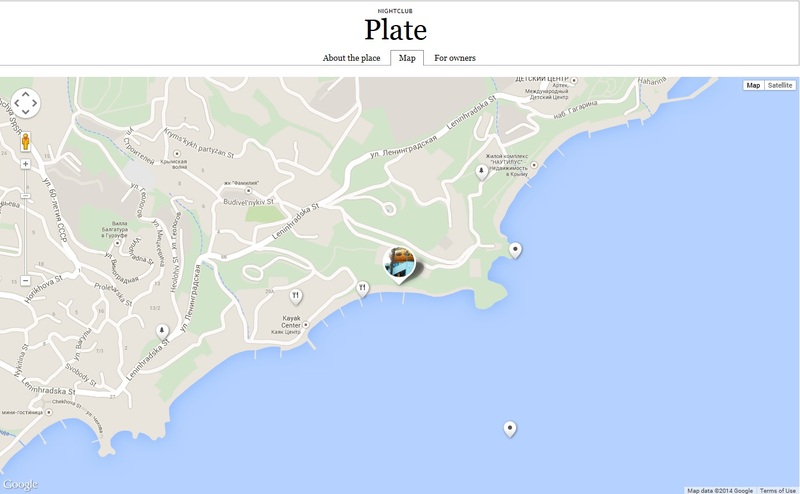 The webpage lists an address and phone number for the Plate but in among all of the translation's to and from Russian to get search strings into Google Maps or Google Earth that will actually work I have not been able to come with the actual address yet. The address as given by the website translated to English is Quay Street, 7 but I do not return any results searching for this address. do not, in my opinion, provide enough evidence to allow us to definitively say whether they are of the same location or a different one. That said, the still below from the second of the three videos at left looking down towards the water's edge does show a surface not dissimilar to that seen in the photo above and they could easily be the same location from different angles, one looking down from the Plate and the other looking up from the water's edge. 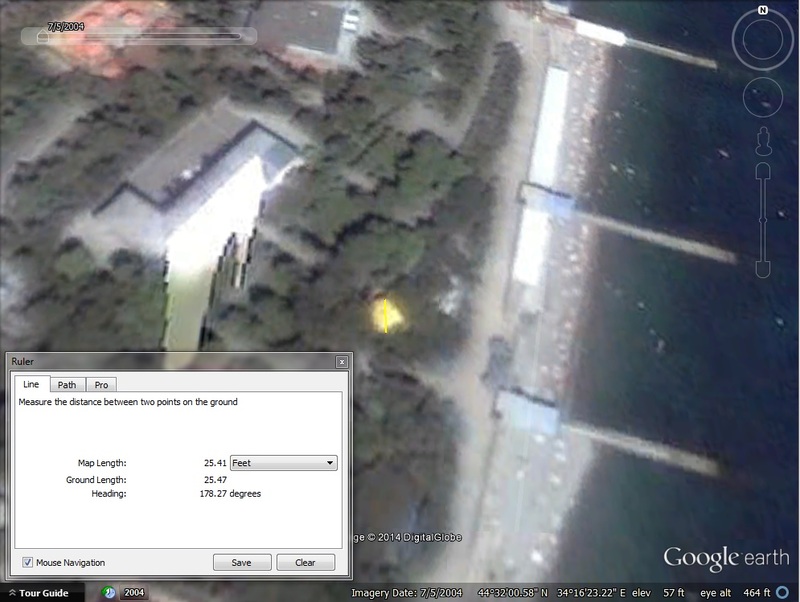 but if you switch to satellite view there is no evidence of the Futuro being at the indicated location. but the trouble is that if the Bing maps "scale" is even anywhere approaching accurate then this object is too big to be a Futuro as shown in the image below with the "Futuro" shifted nearer the "scale." 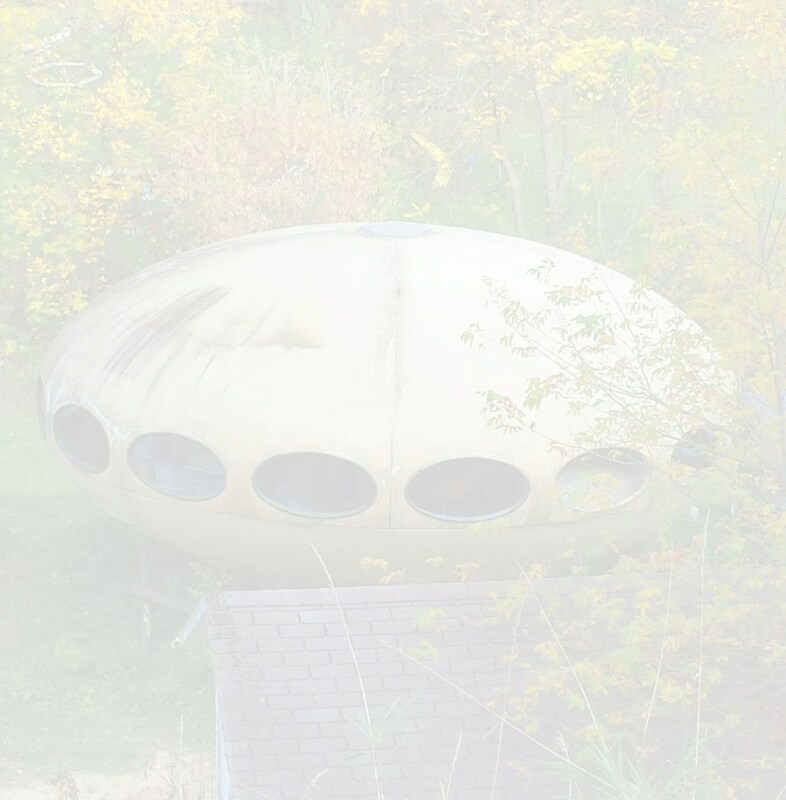 In addition the object appears to have a grayish color whereas the Futuro is yellow. 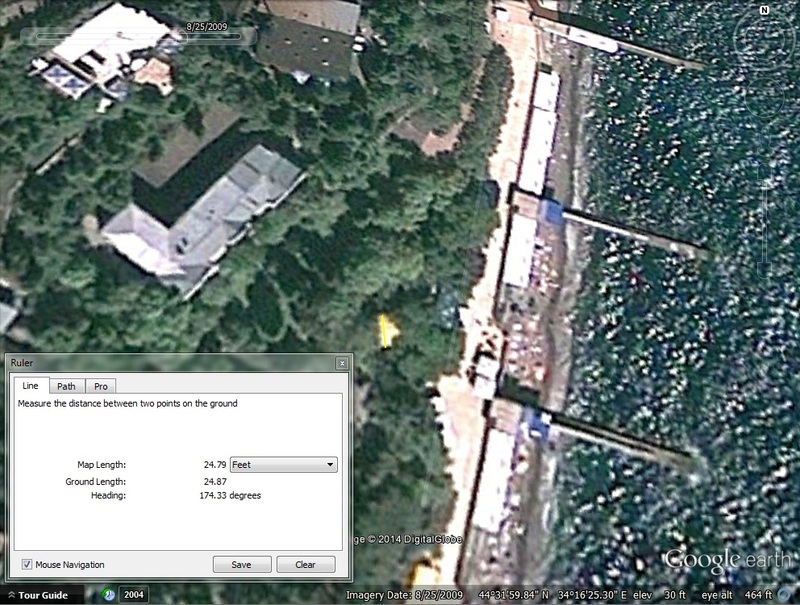 Both of these features, size and color, are also apparent in this screenshot from Google Earth imagery dated 082509. Perhaps this is the location of the Futuro, satellite imagery is often inconclusive, but if it is not is there any alternative? 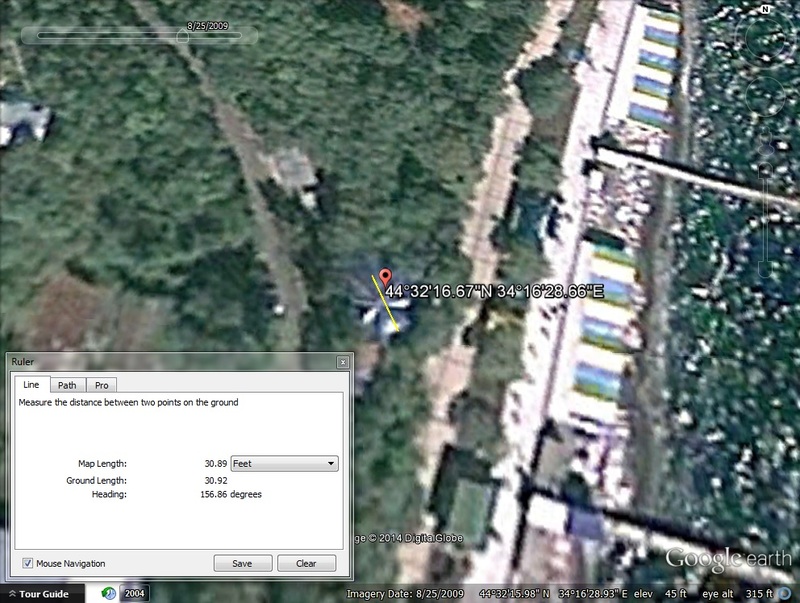 According to Google Maps and Google Earth there is another possibility. 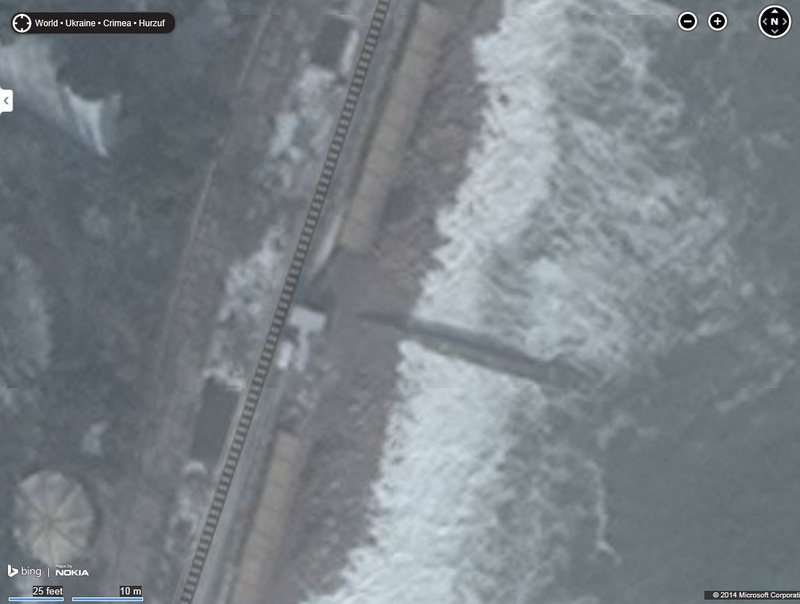 The two images below are screenshots from Google Earth. The location is 44°32'0.24"N 34°16'23.88"E and the imagery is from 070504 [top] and 082509 [bottom] and there we find an object which is approximately the right size for a Futuro though it is difficult to determine if it actually round as it is hidden by trees. However we would expect that given all the trees in the photos. In addition the object is the right color for the Futuro. Finally a map on this webpage places the Plate at this location as does wikimapia.org. It is always exciting to be able to add a newly "rediscovered" Futuro to this site and I always try to do so as soon as possible after finding out about it. Having just heard about this today I have not yet spent much time researching and there is still some work to do determining the address and exact location; hopefully I will able to update in the not too distant future. In the meantime if you can add anything please contact me. You can either email me directly or use my Contact Form. Once again my thanks to Yves for alerting me to this. This photograph by Alexandr Lebedev taken 022419. The original photograph can be seen on Facebook here.